Faunal remains from archaeological sites provide the primary data for learning about human hunting and collecting of animals for food, raw materials, and other purposes. Archaic people did not have writing systems, so there is no written record. Our study shows that Archaic Period groups hunted and collected a diverse variety of animals. The percentages of the kinds of animals collected changed through time. Use of animals also varied across our study area. The environmental changes we discussed in the Past Environments section stimulated some of the changes through time we see in human use of animals. Differences and changes in cultural practices played a role, too. Cultural traditions and choice play a role in human use of animals today, as they did in the past. As noted in the Past Environments section, we created an Eastern Archaic Resource Type Ontology that allowed us to group all the faunal remains from a camp into meaningful categories based on kinds of animals, habitat preferences, and economic importance. 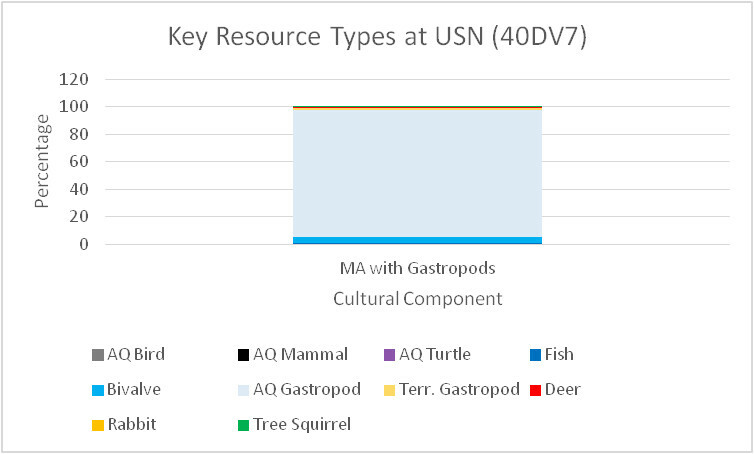 This Resource Type Ontology allowed us to include all of the kinds of animals present at a site. The Past Environments section includes a table that lists all of the categories in the Resource Type Ontology. We identified some key animal taxa that we knew were important to the Archaic Period in our study area. We focused some analyses on these key animal taxa. The key resources we examined included terrestrial animals, animals that lived on the land and water, and fully aquatic animals that lived in the water all the time. 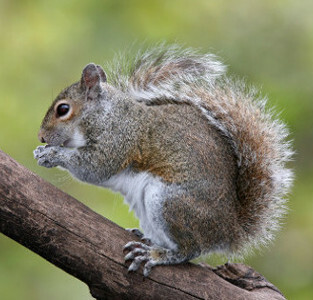 The key terresrtial animals are deer (white-tailed deer image), tree squirrels (grey squirrel image), and rabbits (eastern cottontail image). For the animals that lived on land and in the water, we examined semi-aquatic mammals (muskrat image), birds associated with aquatic habitat (mallard duck image), and aquatic turtles (red-eared turtle image). For fully aquatic animals, we examined fish (brown bullhead image) and freshwater mussels (threeridge image). A list of the kinds of animals that fall into each of these resource categories is provided below. Images taken from Wikimedia Commons and other Public Domains. We calculated the proportions of the animal remains for each of these key taxa for each camp for each site. Because bivalve shells are often broken into numerous pieces, we only included shells that were identified to genus and/or species. We compared the proportions of key resource categories for the Archaic camps at Modoc West Shelter (chart on left), Modoc Main Shelter (central chart) and Koster (chart on right). The graphs help us explore changes through time and differences among sites. Comparing these charts allows you to see some changes through time and also some differences among the sites. How do the proportions of freshwater mussels at Koster differ from those at Modoc Rock Shelter? For Modoc Rock Shelter and Koster, much of the change we see through time is in the percentages of deer, tree squirrels, fish, and freshwater mussels. Look at image to the left that shows all three charts. See if you can see the patterns outlined below. The charts for the Modoc West and Main shelters show some differences between the shelters. The charts generally show that the use of tree squirrels was greatest in the Early Archaic and that the use of white-tailed deer increased in the Middle Archaic. At Modoc, the use of fish increased in the early Middle Archaic and remained high through the Late Archaic. We will discuss some of the differences by time period in the following sections. 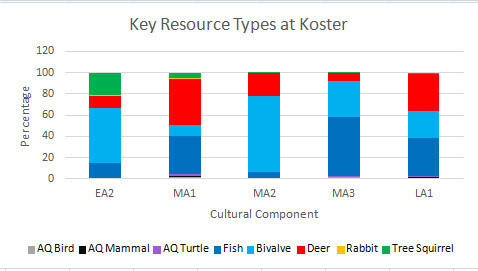 The chart for Koster also shows the greater use of tree squirrels in the Early Archaic and increased use of deer in the Middle Archaic. However, the chart for Koster shows much greater proportions of freshwater mussels than do the charts for Modoc Rock Shelter. The proportion of freshwater mussels is high even for the late Early Archaic occupation. The use of fish at Koster increases dramatically in the late Middle Archaic. This increase is later than that noted for Modoc Rock Shelter. We will discuss these changes and differences in the following sections. 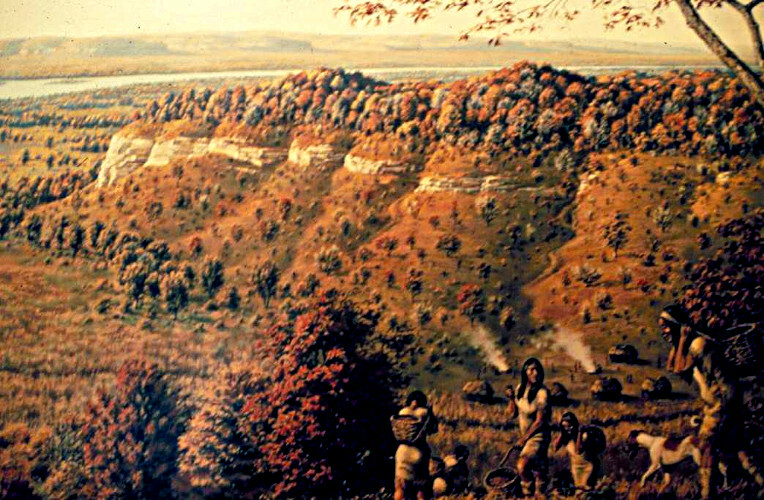 This George Armstrong painting shows an Early Archaic camp in the lower Illinois River valley. The whole group may have lived in a camp such as this for a season. During the next season they would have moved to establish a new camp in another area where desired resources were plentiful. Image used with permission of Center for American Archeology. Where people chose to locate their camps on the landscape and how long they stayed there changed through time during the Archaic Period. In the Illinois area, Early Archaic people made camps all across the landscape including in the river valleys, at the valley edges, and in the uplands. We don’t know the functions of all of these camps, but many were small and were occupied for short timespans (perhaps for a season or part of a season). Some of these camps appear to be abandoned and then re-occupied again and again. We also know that naturally deposited sediments buried many Early Archaic sites in the floodplains of larger rivers and at the bottoms of bluffs. We have a skewed record of where people lived because many Archaic Period sites are buried. The climate and environment were different during the Early Archaic. Climate was more mesic (wetter) at this time and forest was more widespread and closed. That means the trees were closer together and less sunlight penetrated the forest canopy. There would have been fewer plants and less brush on the forest floor for browsing animals such as deer to eat. Areas that historically supported prairie may have been forested during the Early Archaic. Because it was more mesic, streams that were historically small may have been larger in the Early Archaic. These streams may have been more reliable water sources in the Early Archaic and may have been surrounded with trees. Some archaeologists think that Early Archaic people may have used canoes to travel up the tributaries of the larger rivers into the uplands. 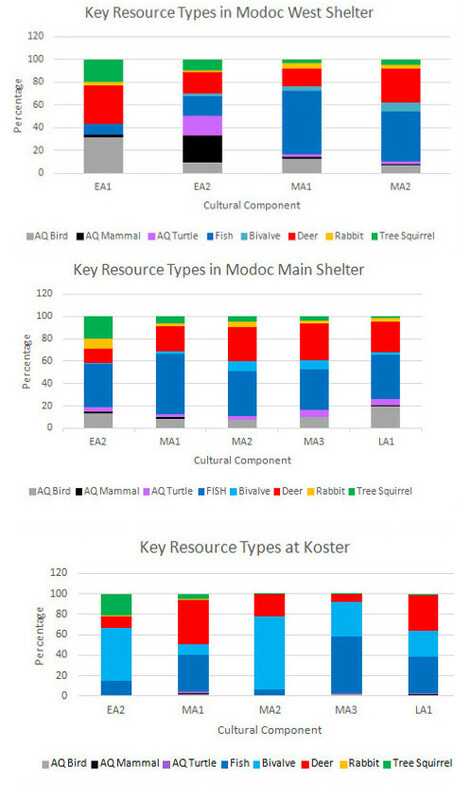 We used the tDAR integration tools to compare the Modoc and Koster databases for the types of taxa and resources types represented in the Early Archaic, Middle Archaic, and Late Archaic subperiods (see bar graphs above). The inhabitants of Early Archaic camps at Modoc Rock Shelter and Koster hunted white-tailed deer, but proportionally less than in the Middle and Late Archaic. They took surprisingly large numbers of tree squirrels (primarily gray and fox squirrels) in the closed canopy forests—especially when compared to later time periods. Remember that squirrels may have fared well in the more closed Early Archaic forests, and deer may have less abundant than in the Middle and Late Archaic. Early Archaic people also used riverine resources such as fish, birds associated with aquatic habitat, semi-aquatic mammals, aquatic turtles, and freshwater mussels. Early Archaic Period people at Modoc and Koster hunted and trapped a wide variety of animals. They occasionally took cottontail rabbits in more open areas and prairie patches. Proportions of rabbits are greater at Modoc than at Koster. Archaeologists have recorded much greater Early Holocene use of rabbits at sites to the west of the Illinois area. Little Freeman Cave in our study area in central Missouri showed greater use of rabbits. 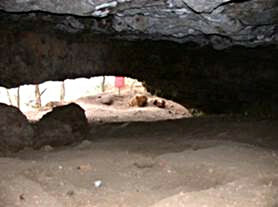 Other sites such as Rodgers Shelter, located west of Little Freeman Cave in Missouri, also showed greater use of rabbits than our sites in Illinois. The Passenger Pigeon bones recovered at Modoc Rock Shelter included a fragment of a humerus (wing bone) from Early Archaic deposits (upper left). We compared the bone to a Passenger Pigeon skeleton in the comparative collection (upper right). Image taken by Bonnie Styles. The lower image shows the 1840 engraving of the John James Audubon painting of Passenger Pigeons (Public Domain via Wikimedia Commons). He painted the image of the female (top) and male (bottom) in Pennsylvania in 1824. Besides deer and tree squirrels, Early Archaic people at Modoc and Koster hunted and trapped animals such as raccoon (Procyon lotor), Virginia opossum (Didelphis virginiana), woodchuck (Marmota monax), turkey (Meleagris gallopavo), Passenger Pigeon (Ectopistes migratorius, identified only for Modoc), and eastern box turtle (Terrapene carolina) in the forest and along the forest edge. They procured semi-aquatic mammals such as muskrat and wading and marsh birds such as grebes, coots, and herons along water courses. Early Archaic peoples at Modoc and Koster collected waterfowl (ducks, geese, and swans), fish, aquatic turtles, freshwater mussels, and freshwater gastropods from rivers and streams. Recovery of bones from Passenger Pigeons at Modoc Rock Shelter and other archaeological sites in the Eastern United States provides information on the distribution of this once abundant bird. Based on historic descriptions some flocks of Passenger Pigeons were so large that they darkened the sky. Hunting and clearing of the forest in the late nineteenth and early twentieth century drove the Passenger Pigeon to extinction. The last Passenger Pigeon died in the Cincinnati Zoo in 1914. 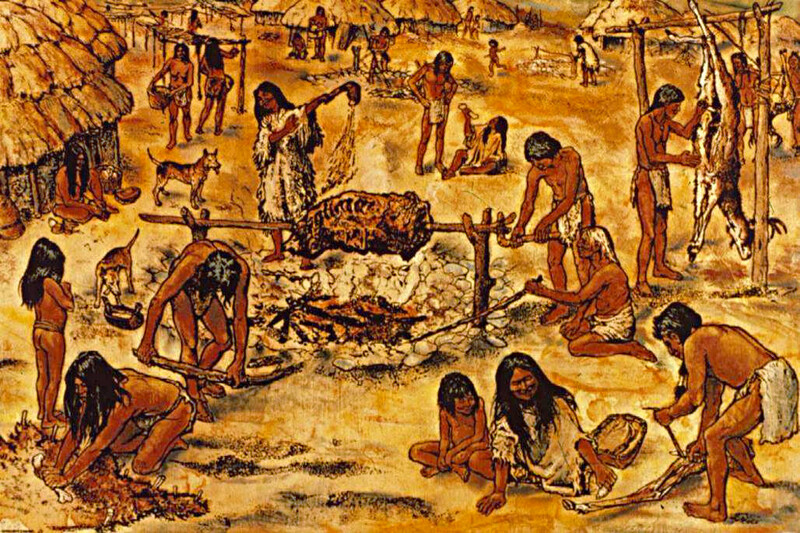 Most archaeologists have argued that Early Archaic groups established camps that were occupied for relatively short time periods, perhaps a season or part of a season. People may have moved the whole camp from place-to place to pursue seasonally available resources. For example, in the fall, a group may have established a camp to exploit nuts, acorns, and deer along the forest and forest edge. In the summer, they may have moved and established a camp to collect fish, aquatic turtles, and freshwater mussels. During the spring and fall waterfowl migrations, they may have moved again and established a camp to hunt migratory waterfowl along with fish, aquatic turtles, semi-aquatic mammals, and freshwater mussels. Some archaeologists describe these kinds of settlements as residential camps. They refer to this type of mobility as residential mobility because the whole group moves their residence at the same time. The same group or other groups may have returned to these camp locations year-after-year, which makes some of these sites look big. Based on the faunal remains and other archaeological evidence, we think the Early Archaic camps at Modoc and Koster represent these kinds of settlements. Gray squirrels may have been relatively more abundant and white-tailed deer may have been less abundant in the closed forests of the Early Holocene. Tree squirrel bones are unusually abundant in Early Archaic Period camps. Image taken from Wikimedia Commons. Some of the hunting patterns we see at Koster and Modoc are widespread in the Midwestern and eastern United States during the Early Archaic Period. A pattern of relatively high usage of squirrels during the Early Archaic when compared to later time periods has been documented by Drs. Bonnie Styles and Bruce McMillan and by Drs. 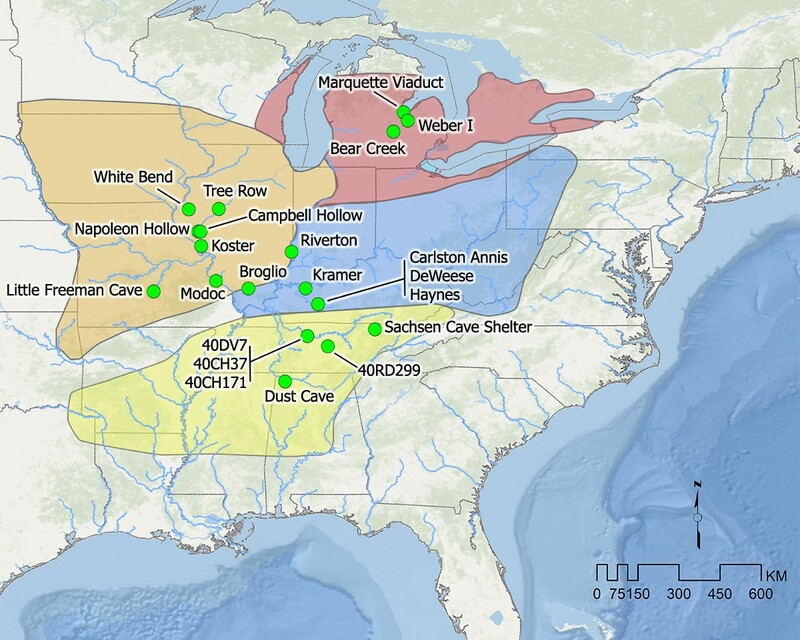 Styles and Walter Klippel for other Early Archaic camps in Illinois, southern Wisconsin (Raddatz Rock Shelter), the Ozark Highlands of west-central and central Missouri (Rodgers Shelter and Little Freeman Cave), the northern border of the Ozark Highlands in Missouri (Graham Cave), and a number of sites in the Mid-South (e.g., Stanfield-Worley Bluff Shelter, Russell Cave, and Dust Shelter in northern Alabama). The Early Archaic hunters and gatherers at Little Freeman Cave (chart and image to left above) and at other sites in the central and west-central Ozark Highlands of Missouri made use of a diverse variety of animals. They made greater use of eastern cottontail rabbits than did Early Archaic Period hunters living farther to the east in the Illinois area. Warming and drying occurred earlier to the west of Illinois area and may have had detrimental effects on the forest. They took tree squirrels and deer in equal proportions. They made less use of fish and freshwater mussels than noted for the Modoc Main Shelter or the Koster site in the Illinois area, but took a fair number of birds associated with aquatic habitats similar to the West Shelter at Modoc. Early Archaic Period people at Dust Cave along the Tennessee River floodplain in our Mid-South subarea (chart and image to right above) focused on fishing at late summer and early fall camps. They took squirrel and white-tailed deer in equal, but relatively lower proportions than in the Illinois area. Dust Cave image provided by Renee Walker. Late Early Archaic groups at the Koster site collected numerous freshwater mussels. Threeridge mussels (Amblema plicata) are abundant and indicate exploitation of large river habitat with swift to moderate current (most likely the Illinois River). Image taken from the Public Domain. 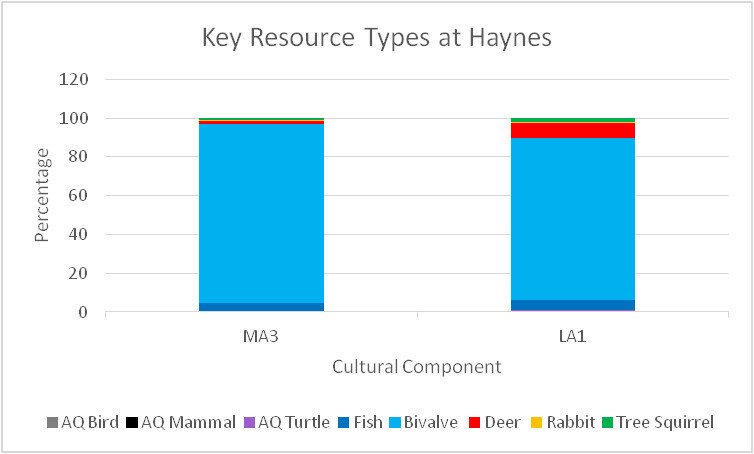 Although we have few Early Archaic sites in our study, use of aquatic resources appears to vary. Late Early Archaic camps at Koster and Modoc show greater use of aquatic resources than Early Archaic occupations at the western sites in the Prairie Peninsula such as Little Freeman Cave. Koster shows much greater usage of freshwater mussels than do the other Early Archaic sites. The high proportion of mussels at Koster dwarfs use of other resources including fish. 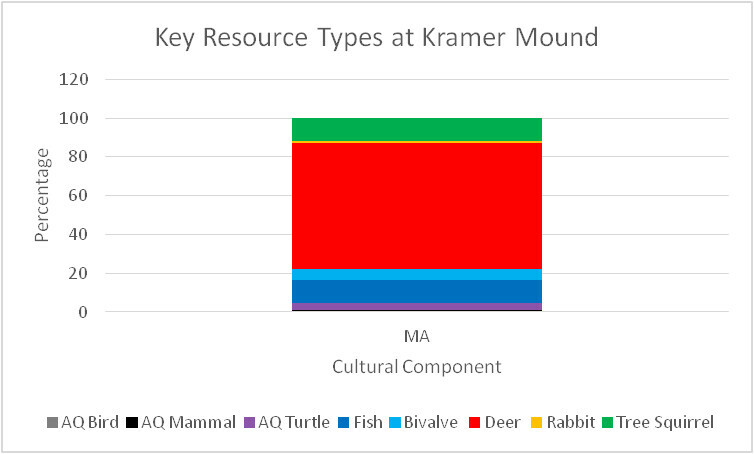 Proportional use of fish is greater in the late Early Archaic at Modoc Rock Shelter than at Koster, but Modoc Rock Shelter shows a very low proportion of freshwater mussels. As noted above, the Early Archaic occupation at Dust Cave in northern Alabama shows proportionally greater use of fish than the Illinois sites. The late Early Archaic at Modoc Main Shelter shows relatively high usage of fish and aquatic birds. 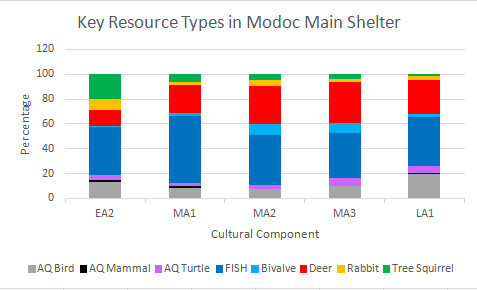 The late Early Archaic at Modoc West Shelter shows high use of semi-aquatic mammals (especially muskrat), and aquatic turtles when compared to Koster and the Modoc Main Shelter. 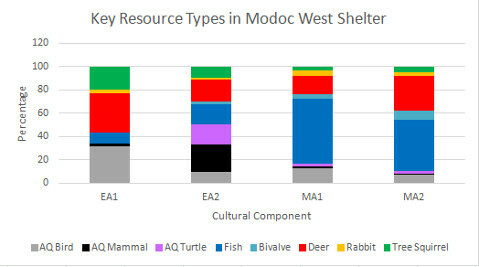 The proportion of fish in the Modoc West Shelter is intermediate between the Modoc Main Shelter and Koster. The Modoc West Shelter also showed a relatively high representation of aquatic gastropods (not plotted in chart). The rich aquatic resources of the Illinois and Mississippi River valleys clearly played a role in the high representation of aquatic resources from the Late Early Archaic Period on at Modoc and Koster, but which aquatic resources were selected varies. We are exploring this variability in the use of aquatic resources across our study area. We are examining the role of seasonal differences in occupation as well as differences in cultural practices, technology, and traditions. 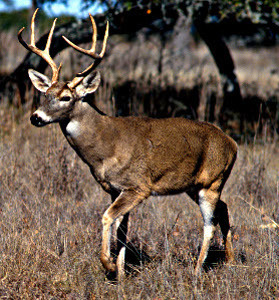 The white-tailed deer (Odocoileus virginianus) is the most common large mammal in Archaic deposits at Modoc and Koster. It is proportionally abundant in the small sample from the early Early Archaic deposits in the Modoc West Shelter. However, in general, the proportion of deer is greater in Middle Archaic than in Early Archaic camps in the Illinois area. Image taken from Wikimedia Commons. The long period of warming and drying and the opening of the forest in the Middle Holocene benefited edge animals such as white-tailed deer in the Illinois area, and their populations likely increased. In general, Middle Archaic groups at Modoc and Koster took more deer and fewer squirrels than their predecessors. We recover Greater Prairie Chicken (Tympanuchus cupido) bones in Middle Archaic deposits at the Modoc and Koster sites. 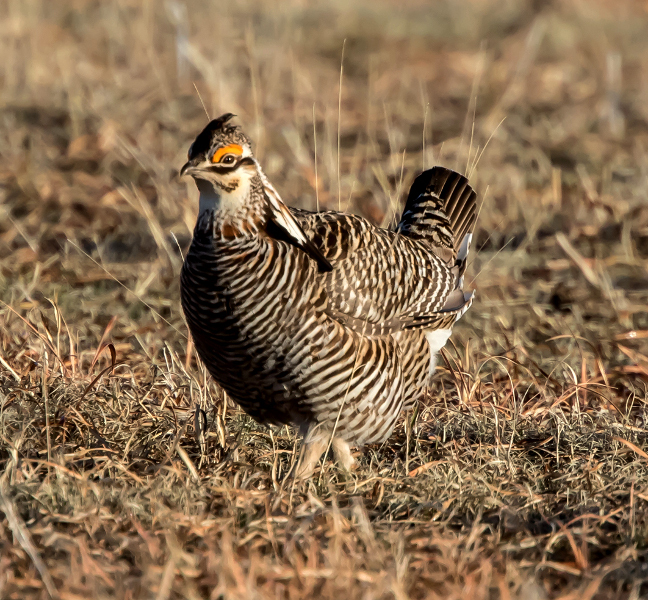 Today, the Greater Prairie Chicken is an endangered species in Illinois and predominately occurs on protected sanctuaries in Southeastern Illinois. Hunting was permanently banned in 1933. Historic human clearing of prairie habitat, primarily for agricultural lands, caused the decline. Image taken from Wikimedia Commons. During the Middle Archaic, prairie expanded in Illinois. However, we don’t see a focus on the hunting of prairie animals at Modoc or Koster. The Middle Archaic inhabitants of these sites only hunted a few prairie taxa, such as Greater Prairie Chicken. Although bison were present in the Illinois area throughout the Archaic Period, finds of bison bone are rare at Archaic Period sites. Faunal assemblages from Modoc and Koster do not include bison remains. Bison herds likely did not expand in the tall grass prairies of the Illinois area until the late prehistoric period. Short and mid grass prairies to the west of Illinois provided better bison habitat than the tall grass prairies of Illinois. Elk (an inhabitant of prairie) and black bear (a woodland species) were also present in Illinois throughout the Archaic Period, but were likely not abundant and were rarely hunted. Only a few elk and no bear remains are reported for Modoc Rock Shelter and Koster. Archaeologists recovered elk remains in Late Archaic deposits at the Riverton site in eastern Illinois and Middle Archaic deposits at the Black Earth site in southern Illinois. 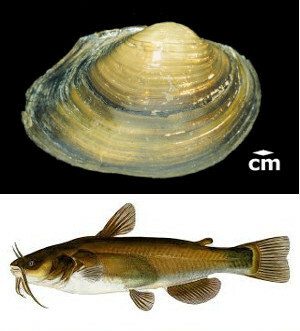 Increases in the giant floater (Pyganodon grandis) (top image, taken by Robert Warren) and bullheads including the brown bullhead (Ameiurus nebulosus) (bottom image, taken from Wikimedia Commons) at the Koster site herald the development of floodbasin lakes in the lower Illinois River valley during the late Middle Archaic. Increases in proportions of quietwater fish such as bowfin (Amia calva) and bullheads at Modoc Rock Shelter show that backwater lakes were present earlier, by the early Middle Archaic in the central Mississippi River valley. The stabilization of rivers continued in the Middle Archaic. By the middle part of the Middle Archaic Period, occupants of Koster camps collected even more mussels from rivers and streams than did the late Early Archaic occupants. By the latter part of the Middle Archaic period, fishing increased in the Koster camps and became much more focused on shallow floodplain lakes. As noted before, these shallow lakes developed during the Middle Archaic. They were extremely productive for fish and likely easier to harvest than the Illinois River. The late Middle Archaic occupants of Koster also collected freshwater mussels from the lakes, but they continued to collect mussels from river and stream habitat. Remember that mussels rely on the current to circulate their food sources so tend to do better in streams and rivers than lakes. Unlike the straight course of the Illinois River, the Mississippi River became a meandering river with oxbow lakes. Geologists document that oxbow lakes may have been available by around 8,000 RCYBP in the vicinity of Modoc Rock Shelter. The use of fish increased at Modoc Rock Shelter around 8,100-8,000 RCYBP, possibly in response to the development of the lakes. As shown in the charts above, the use of fish is proportionally greater at Modoc than at Koster from the late Early Archaic until the Late Middle Archaic Period when floodbasin lakes emerged in the lower Illinois River valley. This pattern is even more apparent when we drop the freshwater mussel shells from the proportions. Representation of fish at Koster is indeed lower than for comparable time periods at Modoc until the late Middle Archaic (around 5,700 RCYBP). We think the emergence of shallow floodbasin and oxbow lakes in the Illinois area had a big impact on human subsistence. The historic productivity of these shallow lakes is well documented. They are loaded with aquatic vegetation and attract waterfowl and spawning fish. They are naturally refilled with water and restocked with fish during annual spring floods. They become easier to exploit as water depth decreases in the summer and fall. It is easier to harvest large numbers of fish in them than in a large river because the fish are trapped within the lake. The lakes also support large numbers of aquatic turtles and attract wading birds and waterfowl. The development of these lakes influenced the use of fish and other aquatic resources. Use of fish increased during the late Middle Archaic Period around 5,700 RCYP in the lower Illinois River valley and during the early Middle Archaic around 8,000 RCYBP in the middle Mississippi River valley of Illinois. Based on archaeological surveys, Middle Archaic settlements appear to be more concentrated along the edges of the major river valleys. This location would have provided great access to both floodplain and upland resources. Hunting and collecting was indeed more focused on forest edge and floodplain resources such as white-tailed deer and fish than in the Early Archaic Period. Archaeologists Drs. Bonnie Styles (Co-Principal Investigator for our grant), Bruce McMillan, Walter Klippel, and others have argued that the opening of the forest would have benefited deer populations and increased their abundance. Based on the abundance and proportions of deer bones at Koster and Modoc Rock Shelter, humans took advantage of the larger populations of deer. 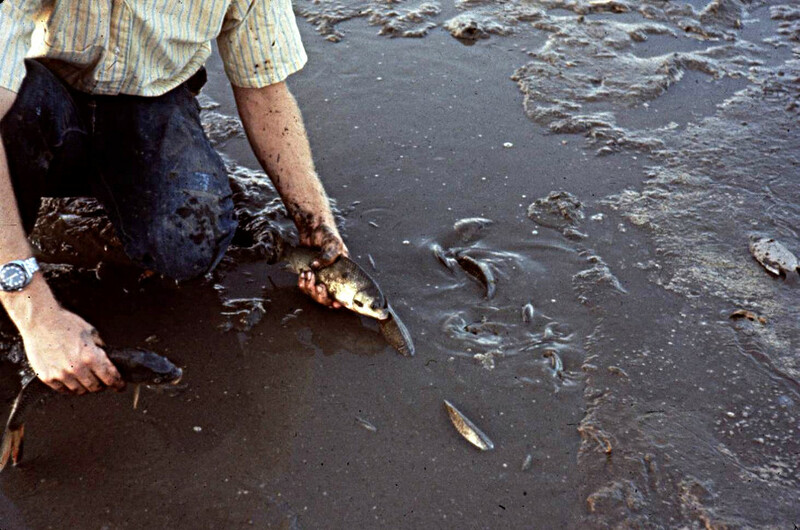 Experimental work by Dr. Bonnie and Tom Styles in 1974 reinforces how productive the floodbasin lakes in the lower Illinois River valley were. The water level in this lake just north of Silver Creek in Calhoun County was already below an optimum level for fish productivity by late September (left image above by Bonnie Styles). Even so, Tom and Bonnie were able to collect over 80 fish by hand in about 30 minutes and could have collected many more with nets or baskets (middle image above by Bonnie Styles). Artist George Armstrong painted this scene of a Middle Archaic fish harvest (right image above, used with permission of the Center for American Archeology). As we used to joke, "the chorus line of women" would drive the fish to one end of the lake where they could easily be harvested with nets or baskets. This George Armstrong painting of a late Middle Archaic base camp at Koster captures the wide range of activities that would take place at a multi-season camp. Small groups would have been sent out from the camp to hunt deer, fish, or pursue other resources. Image used with permission of Center for American Archeology. Dr. Sarah Neusius (Co-Principal Investigator for our grant) and other researchers at Koster have argued that settlement patterns changed in the Middle Archaic. Some of the Middle Archaic occupations at Koster appear to be base camps. As the name suggests, they were bases of operation that were occupied for multiple seasons and longer periods of time. Middle Archaic hunters and gatherers maintained mobility by sending groups out from these base camps to hunt and collect key resources. Archaeologists refer to this kind of mobility as logistical mobility. The groups sent out from the base camps sometimes established short-term camps to collect these key resources and bring them back to the base camps. This type of settlement pattern with its logistical rather than residential mobility may have contributed to the increased use of deer and fish. Some of the Middle Archaic camps at Modoc Rock Shelter also appear to be base camps. As was the case for the Early Archaic, our study documents variability in Middle Archaic subsistence practices across our broad study area (see map below) and surrounding regions. 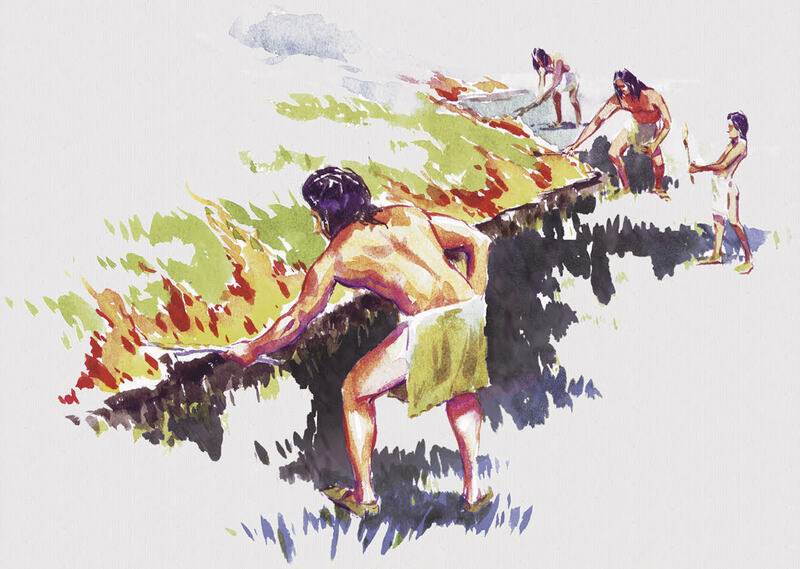 Middle Archaic Period hunters and gatherers in these areas secured the resources needed to support longer-term occupations at base camps but did not all focus on the same resources. In the Illinois Prairie Peninsula area, Drs. Sarah Neusius, Bonnie Styles, and Mona Colburn showed that Middle Archaic hunters and gatherers in the lower Illinois and middle Mississippi River valleys focused on deer, fish, and other aquatic resources. As noted above, freshwater mussels and fish dominate the aquatic resources at Koster and fish dominate at the Main and West Shelters at Modoc. In the Great Lakes subarea, Dr. Beverley Smith showed that hunters and gatherers at the Bear Creek site (a warm weather occupation) in the Saginaw Drainage Basin of Michigan focused on deer, aquatic turtles, and semi-aquatic mammals, especially muskrat. They also collected bivalves, but most were small fingernail clams that would have provided little meat. Middle Archaic hunters and gatherers at the Weber 1 site, also in the Saginaw Drainage Basin of Michigan, focused on deer at this late summer and fall occupation. For hunter gatherers in these northern areas, seasonal changes clearly influenced use of aquatic resources during the Middle Archaic Period. 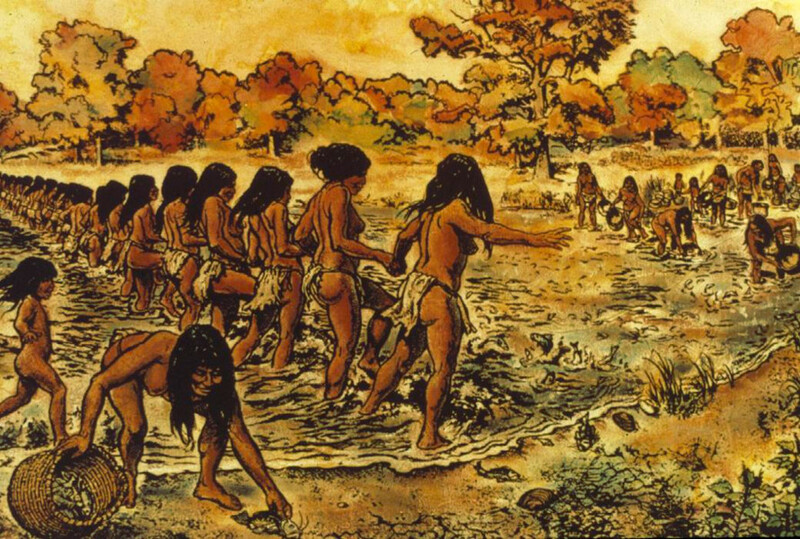 Middle Archaic people hunted and collected numerous aquatic resources at the warm weather camp at the Bear Creek site in the Saginaw Drainage Basin in our Great Lakes subarea. At the late summer and fall occupation at the Weber I site, also in the Saginaw Drainage Basin, hunting focused on white-tailed deer. Dr. George Crothers showed that Middle Archaic hunter gatherers in the Green River drainage (in our Ohio River Drainage subarea) primarily focused on freshwater mussels, and also fished and collected aquatic turtles. However, Tanya Peres, documented that the Middle Archaic people at the Kramer Mound site in southern Indiana focused on white-tailed deer and other terrestrial resources, including tree squirrels. They fished, but did not collect many freshwater mussels. Although located in the Ohio River Drainage, this site is not a shell mound. We would not group it with the Shell Mound Archaic. 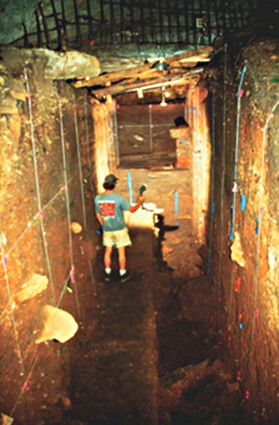 Middle Archaic people at the Haynes site, a Green River shell midden site in Kentucky, primarily collected freshwater mussels. They also hunted deer and trapped tree squirrels. The Middle Archaic occupants of the Kramer Mound site in southern Indiana, made little use of freshwater mussels. Their hunting pursuits focused on white-tailed deer. They also made considerable use of tree squirrels and fished. In our Mid-South subarea, Dr. Tanya Peres showed that aquatic gastropods dominated Middle Archaic faunal assemblages in the Cumberland River valley of Tennessee. Three sites located along the Cumberland River in Tennessee, including the USN site, showed extremely high proportions of gastropods. Black Cat Cave, also in the Cumberland drainage showed a high proportion of gastropods. The Middle Archaic inhabitants of these sites clearly liked aquatic gastropods. The limestone ledges in the Cumberland River provide ideal habitat for aquatic snails. As noted in the section on Management and Domestication, Dr. Peres argues that Middle Archaic Period people in the Cumberland Drainage managed the gastropod beds to ensure the reliability of this important food resource. Team member Dr. Renee Walker reported that the Middle Archaic occupants of the Dust Cave site in Northwest Alabama continued to focus on fishing, but also hunted more white-tailed deer, tree squirrels, and cottontail rabbits than did the Early Archaic occupants of the cave. 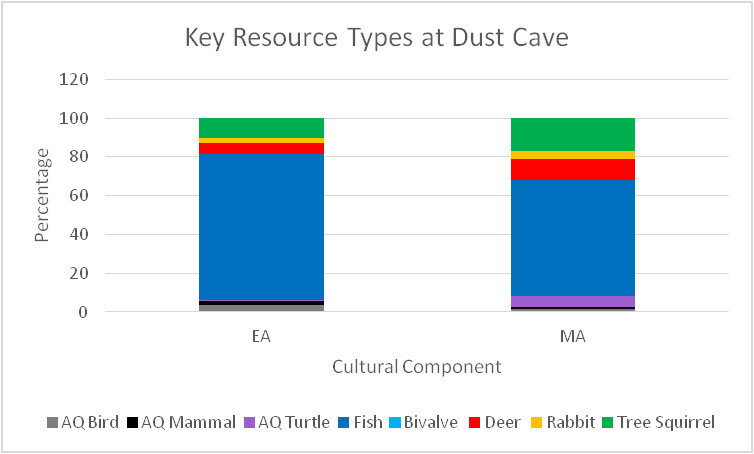 They also took more aquatic turtles than did the Early Archaic occupants (see Dust Cave Graph in the Early Archaic section above). 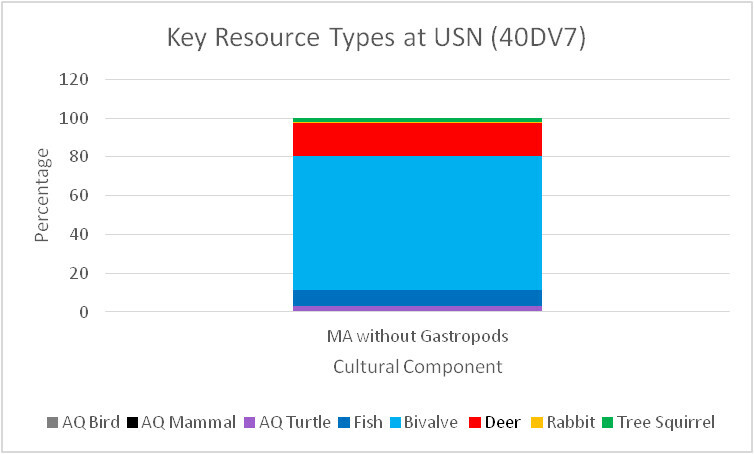 Based on our key resource types, Middle Archaic occupants of the USN site in the Cumberland River valley of Tennessee collected large numbers of freshwater mussels and hunted deer. They also fished and collected aquatic turtles (image on far left above). However, they primarily collected freshwater gastropods. When we add gastropods to the resource types, then proportions for all other resources are barely visible (second image from left above). Black Cat Cave shows a similar pattern, but with a larger apparent focus on collection of freshwater mussels and less hunting of terrestrial mammals (third image from left above). 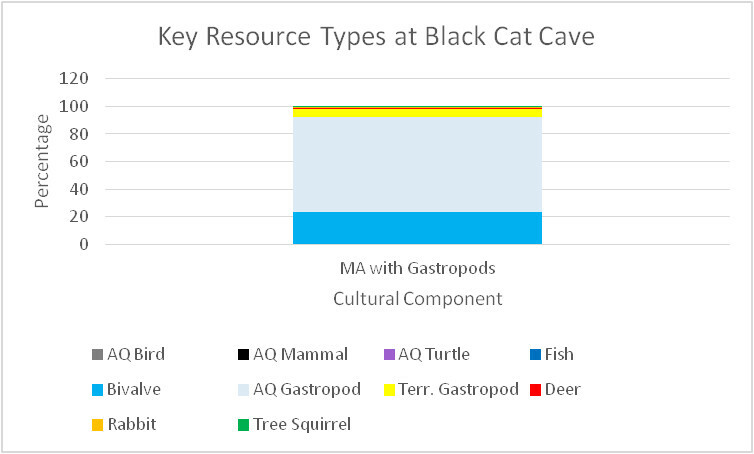 When we add gastropods to the resource types for Black Cat Cave, then collection of gastropods appears to be the major focus (image on far right above). However collection of freshwater mussels played a greater role than at USN. The proportion of terrestrial gastropods at Black Cat Cave outnumbers all other terrestrial resources. It is not clear if the Middle Archaic people were eating the terrestrial gastropods or if these snails were attracted to the detritus in the cave. In a previous study, Drs. Bonnie Styles and Bruce McMillan documented that in the tall grass prairies west of Illinois and Missouri, Middle Archaic groups focused on bison and fish. However, on the western border of the Prairie Peninsula in Missouri, hunters and gatherers primarily procured small game. The Middle Archaic people at Little Freeman Cave in the Ozark Highlands of Central Missouri took more deer than did the Early Archaic occupants of the cave, but continued to take large numbers of eastern cottontail rabbits and tree squirrels. They also continued to take aquatic birds and to fish (see Little Freeman Cave graph in Early Archaic section above). In the lower Illinois and central Mississippi River valleys, deer hunting and fishing increased. In the open forests of the Midwestern United States in areas away from major river valleys, hunters focused on deer and other game, and there was less use of fish. In the Great Lakes area of Michigan we see strong seasonal variation in the use of deer and aquatic resources. We know that environmental changes affected these subareas differently but played a role in stimulating changes. We also know that differences in cultural practices, technology, and traditions contributed to the differences we see. During the Late Archaic Period, climate became more mesic. Trees would have begun to encroach on the prairies that expanded in the Middle Archaic Period. Human burning of prairies during hunting drives may have helped maintain them by killing trees. Image taken from prairie diorama in the Illinois State Museum Changes exhibition. Deer and fish continued to be important in the Late Archaic Period at camps at Modoc, Koster, and other sites in Illinois. However, as was the case for the Early Archaic, people established settlements all across the landscape, including the uplands. By 4,700 RCYBP in the Late Holocene, the climate was more mesic than in the Middle Holocene. The long period of warming and drying that grossly overlapped with the Middle Archaic Period ended. Forest encroached on the prairies. The earliest of the Late Archaic camps (considered part of the Falling Springs Phase) at Modoc Rock Shelter appear to have been base camps. Hunters and collectors took a diverse variety of animals. They focused on deer and fish as was the case for the Middle Archaic base camps. However, later camps in the early Late Archaic (considered part of the Titterington Phase) show a greater focus on white-tailed deer and other terrestrial resources. Hunters at these camps (called field camps) focused on deer hunting and processing. All of these field camps fall within the early part of the Late Archaic Period at Modoc. They show that the shelter was variously used for long-term base camps and later for more specialized “field” camps that were linked with base camps elsewhere. The early Late Archaic camps at Koster (considered as part of the Titterington Phase) were established during a time with the sediment was not building up at Koster. Late Archaic remains are found within an ancient soil. They were not rapidly buried like the earlier remains at the site. Bones and shells were exposed on the surface longer and are not as well preserved as earlier remains. Thus, our understanding of Late Archaic human use of fauna for the Koster site is not as good as for the earlier periods. This image of the Riverton site shows archaeologists standing on three of the prepared clay platforms. Image taken from The Riverton Culture by Howard D. Winters, Illinois State Museum Report of Investigations, No. 13, 1969. Elsewhere in the Illinois area, we know that Late Archaic peoples established long-term base camp occupations. 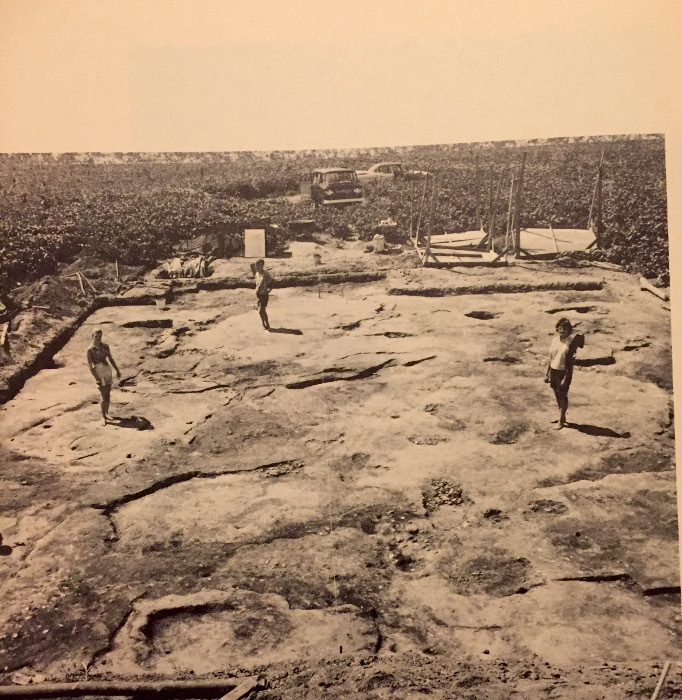 For example, the Late Archaic occupants at the Riverton site, located on a terrace along the Wabash River in Eastern Illinois, built prepared clay platform floors. Features at this site include the clay platforms, deep cylindrical pits, shallow basins, numerous hearths, and a burial area. The cylindrical pits may have been deep earth ovens. The Late Archaic Indians may have used some of the pits to process acorns and others to steam freshwater mussels. Archaeologist Dr, Howard Winters interpreted Riverton as a base camp occupied from mid-May to early September. The occupants of the base camp hunted deer, raccoon, and opossum. They also took beaver, muskrat, mink (Neovison vison) and river otter (Lontra canadensis) from the Wabash River and its backwaters. They hunted more turkey than any other birds. Box turtle (Terrapene sp.) predominated among the turtle remains at Riverton, but the Late Archaic occupants also collected aquatic turtles. The abundance of bowfin (Amia calva) shows that the Indians fished the quiet waters of the river and backwaters. They also took river catfishes and bullhead catfishes. Abundant grooved sandstone sinkers at the site provide evidence for the use of nets. Over 8,000 mussel shells show that inhabitants consumed numerous freshwater mussels. They also procured large aquatic snails and likely consumed them as well. 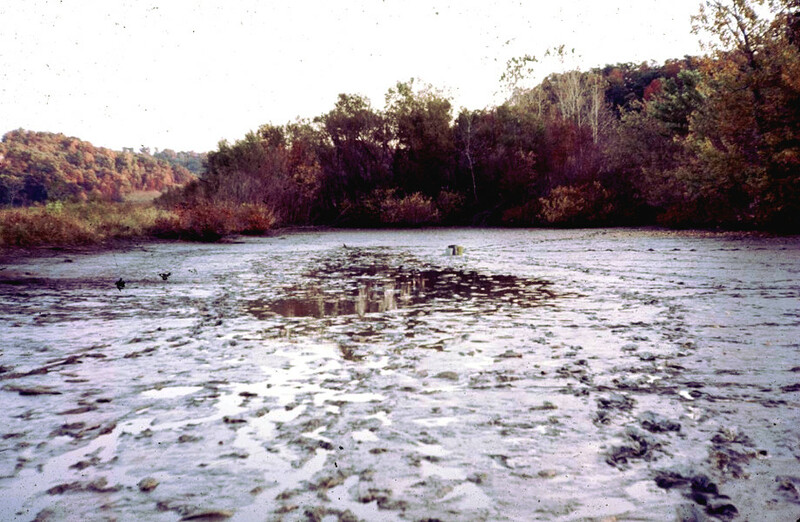 The abundance of freshwater mussels at this site, led Dr. Winters to compare the site to the “Shell Mound Archaic” sites of the Ohio River Drainage, such as the Green River Shell Midden sites in our grant study area. Team member Mona Colburn created a database using the written records for this site and added it to tDAR. The location of the site is plotted on our study area map (see map below). 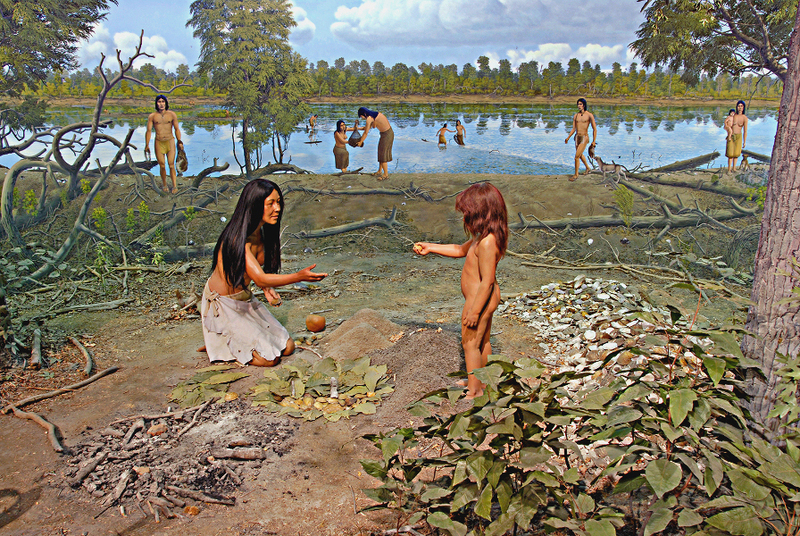 The Late Archaic Period diorama in the Illinois State Museum's Peoples of the Past exhibition shows a seasonally occupied Late Archaic Riverton Culture camp for the exploitation of riverine resources including freshwater mussels, fish, and muskrats. We based the Archaic diorama in the ISM’s Peoples of the Past exhibition on the Swan Island site, which is located about 12 miles from the Riverton site. Dr. Howard Winter’s suggested that Swan Island was a camp occupied in the spring and fall and was part of the system of settlements, including Riverton, used by the Late Archaic Period people in the area. Throughout the Archaic Period we see differences within and among sites in our Great Lakes, Prairie Peninsula, Ohio River Drainage, and Mid-South subregions. 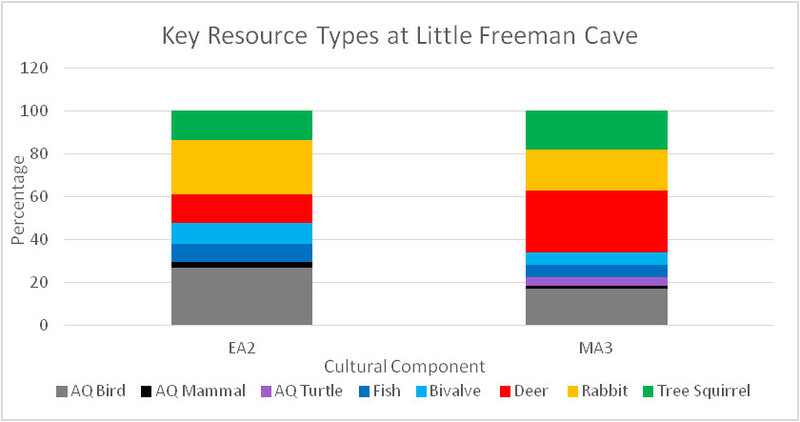 Our project documents considerable variability in resource use across our study area. The early Late Archaic hunters in the Main Shelter at Modoc that lived in the base camps made great use of deer, aquatic birds, and fish. The Late Archaic occupants of the later field camps at Modoc focused more on deer and other terrestrial resources. Deer, fish and freshwater mussels dominated the poorly preserved Late Archaic faunal assemblage from Koster. Late Archaic occupants of the Napoleon Hollow site in the lower Illinois River valley focused on deer and fish. The Late Archaic settlement at the White Bend site in the northern Prairie Peninsula of Illinois showed a focus on deer, semi-aquatic mammals, and fish. The Tree Row site, located in the central Illinois River valley of Illinois, showed a focus on deer, semi-aquatic mammals, fish, and freshwater mussels. The Late Archaic occupants of the Bear Creek site in the Saginaw Drainage of the Great Lakes subarea of Michigan focused more on deer than the late Middle Archaic occupants, but continued to hunt and collect semi-aquatic mammals and aquatic turtles. 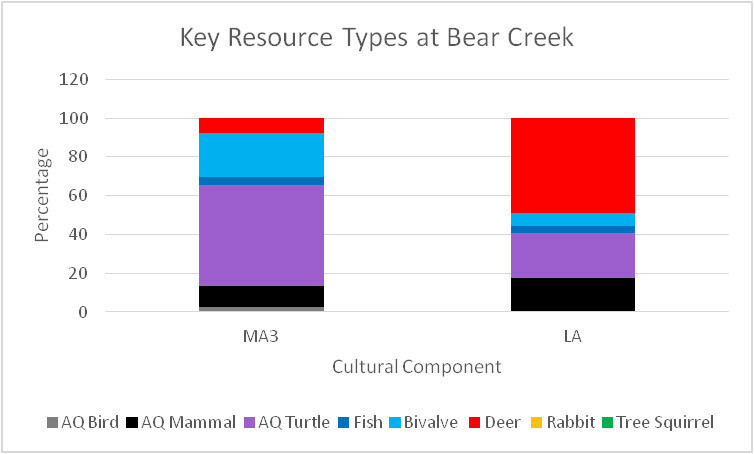 They took lower proportions of the fish and freshwater mussels than did the late Middle Archaic occupants of the site (see Bear Creek graph in Middle Archaic section). 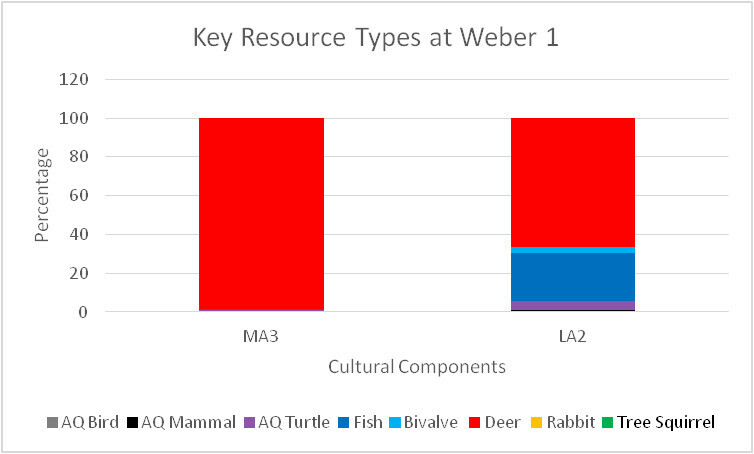 Late Archaic occupants of the Weber I site in the Saginaw Drainage of Michigan concentrated on deer and fish, but also collected some aquatic turtles and freshwater mussels (see Weber 1 graph in Middle Archaic section). Dr. Beverley Smith relates the increased use of fish at Weber 1 to rising water levels in Lake Huron and the creation of marshland habitat. Fish dominated the faunal assemblage for the Late Archaic camps at the Marquette Viaduct sites in the Saginaw Valley of Michigan, but they also made substantial use of deer, and aquatic birds. 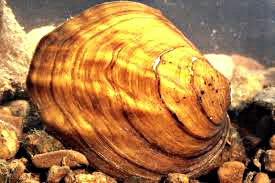 In the Ohio River Drainage subarea, The Late Archaic occupants of the Riverton site in southeastern Illinois collected numerous freshwater mussels and other aquatic resources. The Late Archaic occupants of the Green River sites in Kentucky (Carlston Annis, DeWeese, and Haynes) also focused on the collection of freshwater mussels. All of these sites are considered shell middens and are considered part of the Shell Mound Archaic. The Late Archaic Period people at the Riverton site along the Wabash River valley in eastern Illinois clearly collected numerous freshwater mussels (left image above). The graph of key resource types for Riverton closely resembles that for the Haynes site, a shell midden along the Green River in Kentucky (right side of image on right). Dr. Howard Winters was correct to propose that Riverton Culture sites in Illinois and the Green River Shell Midden sites of Kentucky are all part of what has been called the Shell Mound Archaic. Environmental differences and changes clearly contributed to the differences we see in subsistence practices at the Archaic Period sites across our study area. We will discuss some of the differences in cultural practices that also contributed in the sections that follow.